Lakhani was among presenters at a joint Faculty Research Symposium held May 12 on the HBS campus as an opportunity for faculty from the two schools to highlight a variety of research findings to an audience of doctoral students, staff members, and other professors. The event was one of a series designed to explore opportunities for collaboration ahead of the expansion of the SEAS campus to a new complex across the street from the business school in a few years. The event was one of a series designed to explore opportunities for collaboration ahead of the expansion of the SEAS campus to a new complex across the street from the business school in a few years. His research team recently held a three-week-long contest that looked to improve the accuracy and processing speed of an algorithm designed to analyze genomic data. With a prize pool of $20,000, the contest drew quite a bit of attention; 96 people submitted 410 programs, and 20 of the contestants had ideas that exceeded researchers’ expectations. The best solution increased the accuracy of the data from 91 percent to 97 percent and increased processing speed 15 times over. In fact, 2015 saw one of the highest patent lawsuit counts ever. Most of these suits are being brought by nonpracticing entities (NPEs), firms that don’t actually generate products, but collect massive amounts of patent portfolios. Lauren H. Cohen, the L.E. Simmons Professor in the Finance Unit at HBS, said evidence shows NPEs act as “patent trolls,” suing cash-rich firms for alleged patent violations, and it seems they do so regardless of whether patents were infringed on or not. Congress has considered more than a dozen bills that seek to control patent trolling by slamming companies that are found to be initiating frivolous suits with higher fees after the fact. But for a targeted firm, by that time the damage has already been done, especially when a costly court battle drags on for months. “If you’re a small, innovative firm, you don’t have that kind of time. Your technology will be obsolete,” Cohen said. Yiling Chen, Gordon McKay Professor of Computer Science at SEAS, talked about social computing, where human creativity is used to accomplish computational tasks. Chen, a faculty affiliate at the Center for Research on Computation and Society, is interested in analyzing and designing social computing systems to meet economic goals. About two-thirds of SEAS is moving to Allston, across the Charles River from its current location in Cambridge, in 2020. The move will make it a close neighbor of HBS, and there’s hope the proximity will encourage more collaboration. To that end, the symposium featured an afternoon panel of faculty who are already involved in cross-Harvard collaboration: Daniel Schrag, Sturgis Hooper Professor of Geology, Professor and Area Dean for Environmental Science and Engineering at SEAS, and Director of the Harvard University Center for the Environment; Forest Reinhardt, John D. Black Professor of Business Administration at HBS and co-chair of the School’s Global Energy Seminar; Daniel J. Needleman, Gordon McKay Professor of Applied Physics at SEAS; and Vicki Sato, who servers both as Professor of Management Practice at HBS and an affiliate member of the Department of Molecular and Cell Biology at Harvard. 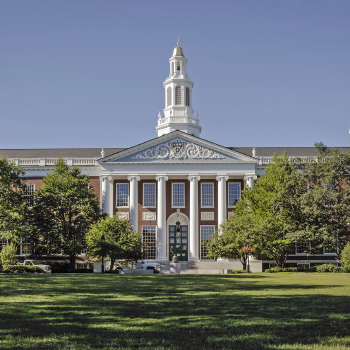 Sato oversees the Blavatnik Fellowship in Life Sciences Entrepreneurship, which provides a select group of HBS MBA alumni the opportunity to work with top Harvard inventors. The goal: to promote the commercialization of promising life science technologies. The program includes projects that have received funding from the Blavatnik Biomedical Accelerator Fund. Needleman received funding from the accelerator last year for a project that involves the success rate of assisted reproductive technologies such as in-vitro fertilization. The panelists also discussed the possibility of collaborating on teaching methods. For instance, some SEAS classes could adopt HBS’s case method of teaching, in which students generally do 85 percent of the talking and the professor serves more as guide than lecturer.